The science fiction writer Ray Bradbury has died, aged 91, in Los Angeles, on Tuesday 5th June 2012 – peacefully, and after a long illness. He was considered one of the most influential in his genre, bringing it into the mainstream alongside such writers as Isaac Asimov and Arthur C Clarke. He sold 8 million copies in 36 languages, reported The New York Times. His most famous books included Fahrenheit 451, in which a dystopian world is imagined where books are burned, (which was made into a film – watch a book-burning scene here) and Something Wicked This Way Comes, as well as short story collections. His career lasted 70 years, with his final essay being published in The New Yorker this week. His first collection of short stories, The Martian Chronicles, celebrated space travel and won critical acclaim. He was born in 1920, in Waukegan, Illinois; his father worked for the electric company and was descended from a woman who’d been tried as a witch at Salem, Mary Bradbury. He was largely self-educated, and attributed his success to the fact that he’d never been to university. He wrote hundreds of short stories and short novels, as well as plays, screenplays, children’s books and essays. His books predicted many things, said the CNN obit, including ATMS and live broadcasts of fleeing cars. The site quoted people from President Barack Obama to Steven Spielberg to Stephen King, all of whom laid their tributes at Bradbury’s feet. Many of his books are being taught in schools. Tributes are pouring in to celebrate the life of a man who brought good science fiction to the masses; who was an inspiration to many; who hated the internet; and who, most importantly, carried on writing until the end. “His legacy lives on in his monumental body of books, film, television and theatre, but more importantly, in the minds and hearts of anyone who read him, because to read him was to know him. He was the biggest kid I know,” said his grandson Danny Karapetian, quoted on The Telegraph. 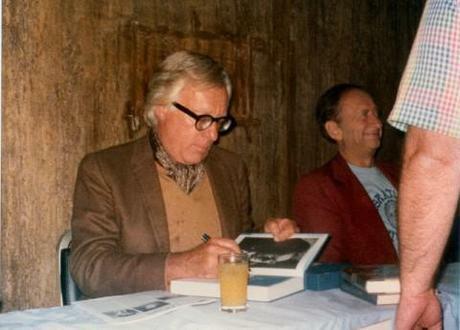 Just finished writing #RayBradbury piece for @GuardianBooks @Sam__WellerSadness. But a great life, and indelible images.